Place: Bogor Agricultural University, Bogor, ID. o Participants of ILAS Workshop come from various universities, they are 50 undergraduate students from Indonesia and overseas. o This workshop is held for students from Landscape Architecture, Architecture, and other equivalent fields. o The participants of ILAS Workshop will be guided by 5 experts in their field as supervisors. 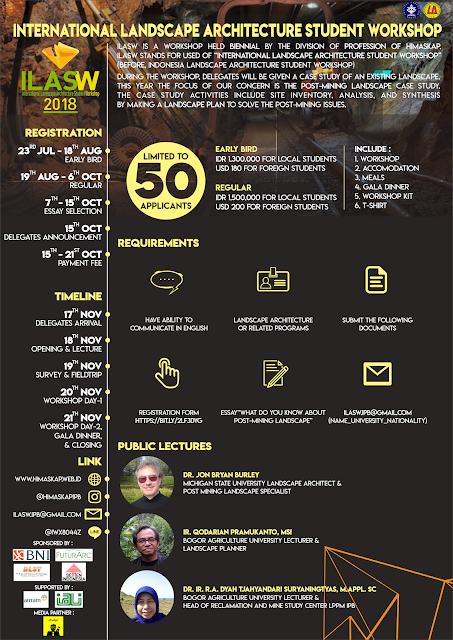 §Participants will be selected based on their knowledge and experiences in Landscape Architecture. §Students with recommendation letter from their home university will be our most priority. o Survey is a site visit activity as participant’s tool to explore the area. o The purpose of this activity is to fulfill the data needs and increase the sense about the site. 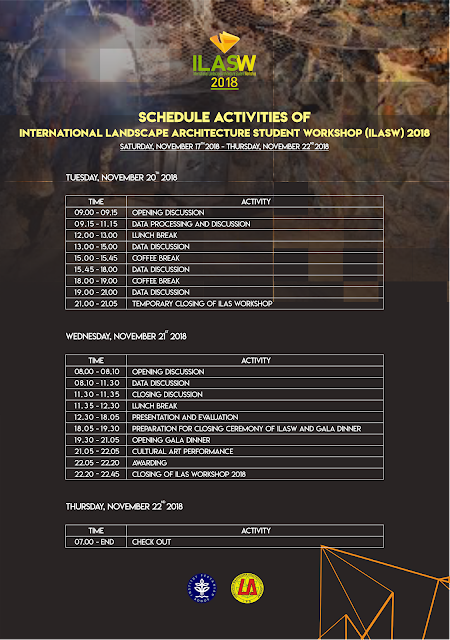 o This activity will be held on the second day of ILAS Workshop. o All participants and committee will visit Kampoeng Wisata Cinangneng as our field trip activity. o This will be the closing ceremony of ILAS Workshop. All participants will have a special dinner with special performance from our IPB guest star. Participants are expected to give some of their performance too. o The concept of this event is ‘Cultural Night’ in order to give all participants an opportunity for exposing their own culture. So please be the best version of your country! 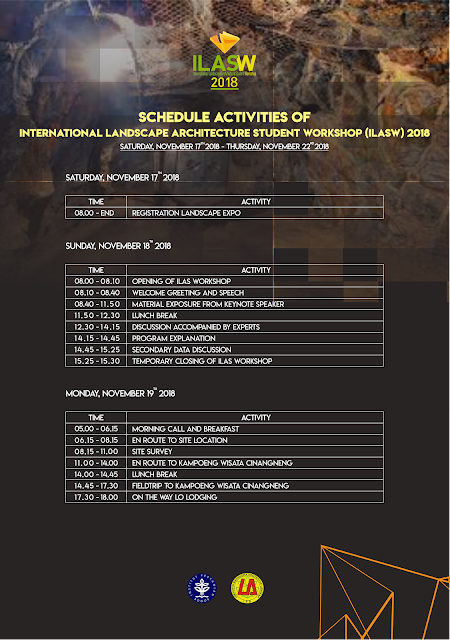 o This Expo will present landscape architecture products such as students projects, artworks, and final works from the previous ILAS Workshop. o On the other hand, this expo will promote local products from some vendors and our alumni. 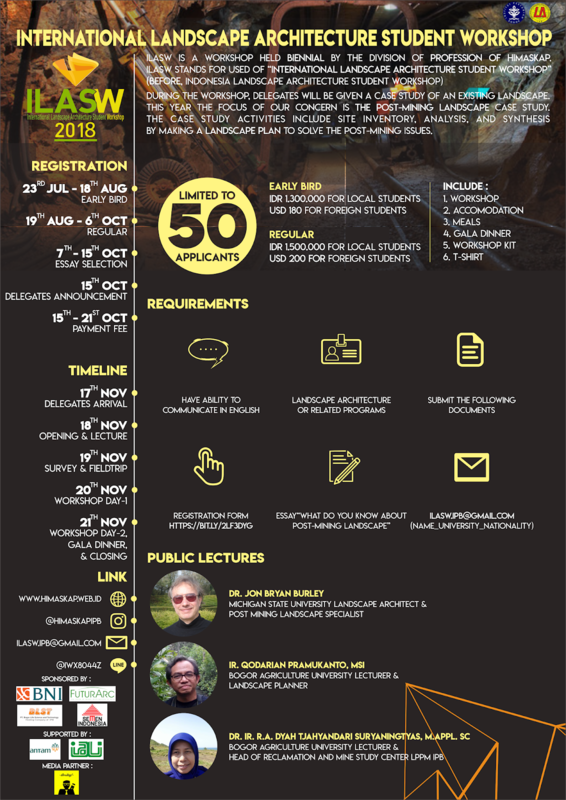 The main purpose of this event is to make a plan for the Post Mining Landscape Site in ANTAM PONGKOR area, Bantar Karet, Nanggung, Bogor Region, West Java Province. Through this event, we hope that we can find and promote the positive sides of post mining landscape and empower the local community around the site.